Recycle your kitchen waste with a well-designed worm farm that works! Ideal for those with limited space and an enviromental conscience. 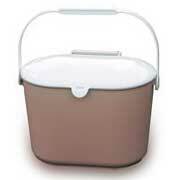 Our Worm Farm comprises of two sturdy polypropylene boxes, which are nested inside each other. The upper box has a perforated floor and a lid, and the lower box is fitted with a drain sprout. By having the worms in the top portion of the bin (kitchen scraps/organic waste is placed) the waste (liquid tea) filters through the perforated holes into the bottom bin that can be combined with water for use as an organic fertilizer rich in nutrients. As the worms actually eat the bacteria in the decomposed food there is no odor to worry about, simply add your scraps and see the results! First of all, line the base of the top box with two or three layers of dampened newspaper. Add some partially rotted compost or potting mix, to form a layer about 1-2 inches deep. Add your purchased worms* and cover with a piece of dampened carpet, burlap or light resistant plastic (such as a garbage bag) cut to size. Place the scraps underneath this cover. Note that the worms eat the decomposed parts of the scraps so by placing them in a separate bin for a few days will accelerate the process. 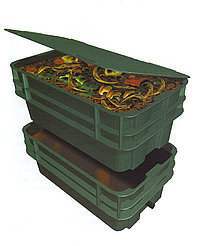 Worms used in your Worm Farm need to be special Composting Worms (red worms). They are fast breeders and can consume their own weight in food in twenty-four hours. One thousand worms are all that is required to start off the farm (two thousand if you want to be up to capacity in a hurry), with each worm producing an egg capsule approximately every two weeks, each capsule containing between five and fifteen worms. These hatch in three weeks time and are mature within three months. The worms will breed to the environment so if you reduce the amount of food so too will the worm population decrease. *All of these topics and more are explained in detail in a foldout instruction sheet included with each bin.